A remastered edition of the point-and-click game The Raven: Legacy of a Master Thief. You try to solve the mystery of an ancient ruby stolen from the British Museum and discover the thief's identity. The Raven Remastered for PC, PS4 and XONE is a new edition of the point-and-click adventure game The Raven: Legacy of a Master Thief. It was developed by the creators of the original production, KING Art Games, and published by THQ Nordic. The plot of The Raven Remastered starts in 1964, when an ancient ruby is stolen from the British Museum. A black feather is found at the crime scene, suggesting that the thief is the famous burglar known as the Raven. One of the game's three protagonist, Constable Anton Jakob Zeller sets out to solve the mystery and arrest the criminal. The task is made no easier by the fact that the constable is rather inexperienced in this type of investigation and knows similar cases only from crime novels. The gameplay of The Raven Remastered focuses on solving puzzles, in which you have to use objects in the right way, although you also have to play logic minigames and talk to NPCs (who often can give you useful information and hints). You get to explore varied locations — the adventure starts in the Orient Express and takes you to a museum in Cairo and aboard the MS Lydia later on. 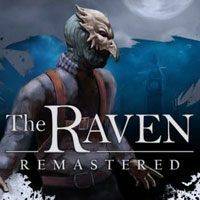 The Raven Remastered features vastly improved visuals, especially animations and character models, as well as an upgraded lighting system and better interface. This game guide for Raven Remastered contains all hints & secrets to help you in playing this adventure game. Our walkthrough consists of solutions for all chapters - finish them correctly and finally solve the mystery of the game's black hat.